Casual Adventure is fading away after 60 years on Washington Boulevard. A new building is going up where Colony House furniture long dwelt in Rosslyn off I-66. The popular Willow restaurant closed two years ago after a decade on Fairfax Drive. Join us at our June meeting to hear columnist and local historian Charlie "Our Man in Arlington" Clark perform an interactive talk on vanished businesses of Arlington, going back to the early 20th century. Be prepared to share your own recollections of favorites that went away. The Committee of 100 welcomes you for a behind the scene tour of Arlington County’s Homeless Services Center. Explore the programs and services offered in our community to help Arlington’s most vulnerable individuals and veterans move from homelessness to a home. This program will provide an exclusive introduction to all the client services provided by the Arlington Street People's Assistance Network (A-SPAN) from the streets all the way to housing. Come and learn from staff and hear first-hand from a client what it takes to move someone from Homelessness to a Home! Enjoy a delicious dinner prepared by A-SPAN’s very own Chef Glenn. Opening statements of 1 minute by each candidate followed by Q&A. The first part of the Q&A will consist of questions from the moderator and the candidates. The remainder of the Q&A will be questions submitted by members of the audience. These questions must be written and submitted on cards that will be collected after the opening statements from the candidates. The moderator will select the questions from those submitted. Each candidate will have 1 minute to respond to the question. The moderator reserves the right to follow up with a request for clarification if he is under the impression that a candidate's answer is unclear or non-responsive. To conclude the forum, each candidate will be given 1 minute for a closing statement. Arlington County's Real Estate Tax Relief (RETR) program is designed to help senior citizens age in their own homes. Since 1991, RETR has helped many seniors and permanently disabled homeowners in our county. Participants in RETR have to meet certain restrictions for household income and assets. Should the program provide an exemption for real estate taxes, deferrals of taxes due, or a combination? What should the values be for the income and asset restrictions? What can Arlington learn from similar programs around the region and country? The working group is about to share its recommendations with the community. Arlington faces challenges in our school system. Demographic projections show many more students will be attending Arlington schools in the near future, which among many challenges will require a discussion of school attendance boundaries. The School Board recently approved changes in the high school attendance boundaries with middle and elementary school boundaries coming up for review in the near future. Boundary changes can be very personal and affect the entire community. How does Arlington tend to these issues yet continue its vision and values? Our February meeting with School Board Chair Nancy Van Doren and Washington-Lee High School student Matthew Herrity when we will discuss recent and future school attendance boundarychanges. The list of terrorist attacks on civilians keeps growing and the types of attacks are expanding and evolving. It seems as though, wherever there is a gathering of people, there is an opportunity for a terrorist attack. With every new attack and every thwarted attack, we learn more, and are better prepared to prevent, and/or to respond. Join Arlington’s Committee of 100, as we hear from and have a discussion with our Police, Fire, & Office of Emergency Management leadership. Governments at all levels are notoriously complex, with different departments and offices serving specific functions. Often this bureaucracy makes it hard for citizens, residents, and business owners to know where to turn for assistance or to receive government services. In response to this challenge, Arlington County has established two ombudsman positions to help resolve government service challenges. Join Committee of 100 on December 14th as we meet Shannon Flanagan-Watson, Arlington’s Business Ombudsman, and Robert Sharpe (photo not available), Arlington’s Resident Ombudsman, to learn more about their roles and how they engage our community, and ask your questions. How Will the Election Results Impact Arlington? Where Will Today's Elementary School Students go to High School? Arlington's population of young children is growing, straining the capacity of many of our elementary schools. Within a decade, these young kids will be teenagers and will need a quality high school education, which Arlington Public Schools will have to provide. Join us on October 19 when we welcome the following speakers for a discussion of different aspects of this challenge and ideas for short- and long-term solutions. What Happens After Metro SafeTrack? 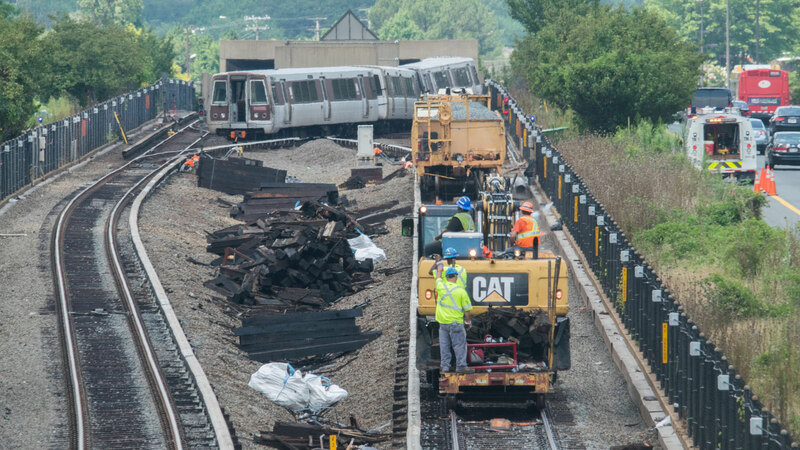 Metro began its ambitious "SafeTrack" maintenance program three months ago, combining large-scale and disruptive service changes to catch up on decades of deferred maintenance. But, it continues to be plagued by new problems as SafeTrack is implemented. Is this the "new normal," or will metro return to previous service levels after SafeTrack is complete in 2017? How will SafeTrack continue to impact commuters in the meantime? Ralph Buehler is an Associate Professor in Urban Affairs & Planning and a Faculty Fellow with the Metropolitan Institute at Virginia Tech's Alexandria Center. Most of his research has an international comparative perspective, contrasting transport and land-use policies, transport systems, and travel behavior in Western Europe and North America. He has received fellowships from the ENO Foundation, the Federal Highway Administration, the Federal Transit Administration, and the German Academic Exchange Service (DAAD). Martine Powers is a reporter for the Washington Post's transportation and development team. She writes primarily about Metro, and generally about trains, planes, and automobiles. She previously worked at the Boston Globe and Politico, and spent a year reporting on traffic and congestion as a Fulbright Fellow in Trinidad and Tobago. Martine is also an audio producer and a graduate of the Transom Story Workshop for audio journalism. Christian Dorsey was elected to the Arlington County Board in November 2015. Christian represents Arlington on the boards of the Washington Metropolitan Transit Authority (WMATA) and the Metropolitan Council of Governments. Additionally, he serves as one of the three Arlington commissioners on the Northern Virginia Transportation Commission (NVTC). The recording of the September program is not available.